SSBB Best Taunt Ever. . Wallpaper and background images in the Super Smash Bros. Brawl club tagged: falco fox sonic super smash bros. brawl. 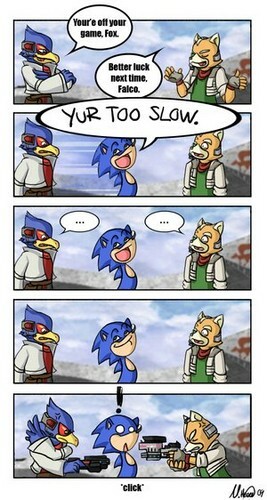 LOL I just looved Falco and Fox's expressions!!! Sonic : UR 2 SLOW!!! Me : See how much faster u r than us without feet.